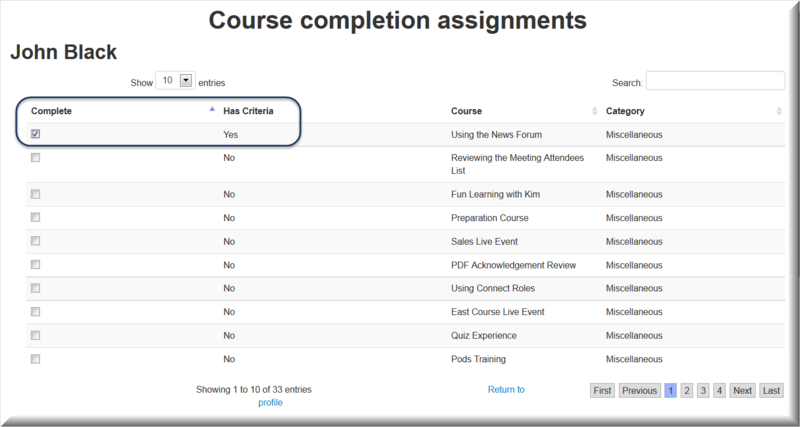 The Course Assignment Tool allows administrators to grant a user completion status from any course on their LMS and, if required, remove completion status. 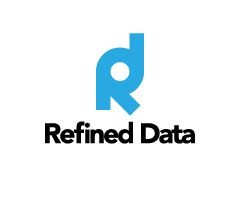 When a user may have done successful work or in the wrong course session, he or she can be given completion credit rather than having to retake the course. This status allows the user to enroll in any subsequent courses having the previous course as a Prerequisite. 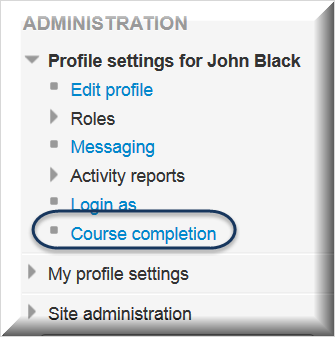 Within the user’s profile, an administrator can select a course to make complete or not complete for that user. Go to Site Administration>>> Users>>> Accounts>>> Browse list of users. Filter for the user and click on their name to navigate to their profile. The Course completion assignments page will appear with the user’s name and a list of all the courses on the site below it. The courses shown as No under Has Criteria have no course Completion criteria set in the course. The courses with a Yes in that column do. 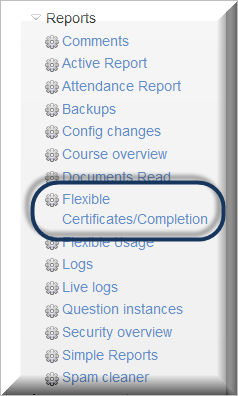 Checks appear in the check box under the Complete column for the courses that the user has already completed or next to courses that have previously been assigned as complete. 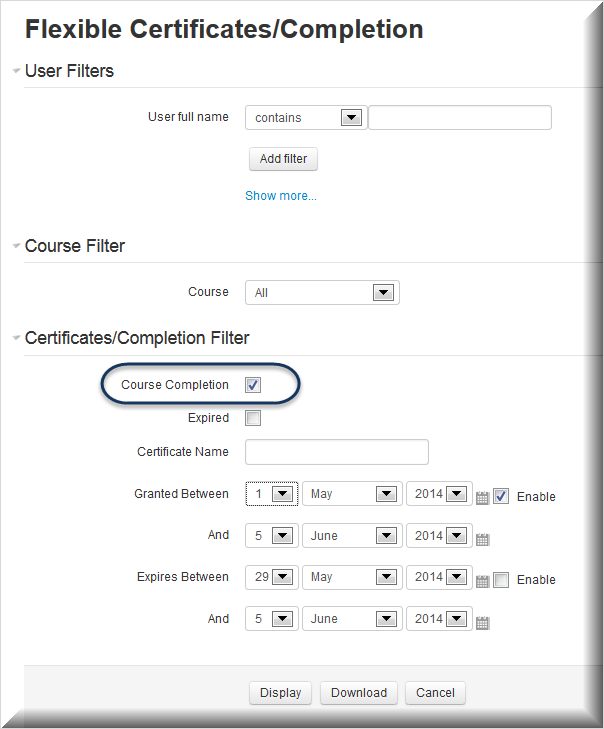 The user will now be able to enroll into any course requiring the selected course as a Prerequisite. The Date Achieved is either the date the user completed the course or the date Course Completion was assigned. If a course has incorrectly been assigned as complete, the administration can un-assign the course. To do so, the administrator follows the same process as in assigning a course as complete. Go to the user’s profile and click on Course Completion. 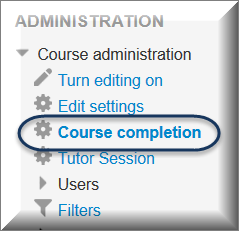 On the Course Completion Assignments page, scroll down to find the course that needs to be changed (the default is to display ten courses at a time; you may enable more to display in order to facilitate finding the course). The certificate does not appear as EXPIRED, it simply disappears from the list. Similarly, in the Flexible Certificate/Completion Report, the user will not be filtered for when Completed is enabled. The record has disappeared.